Malaysian political satire, while existing in the media, has been branded as being insolent to the ruling government with the existence of laws that have freedom of speech under its clutches, threatening to poison the very essence of our nation’s democracy. The few who do create art that pokes fun at the powers that be are vilified and silenced. However, there are those who persist, with strokes of a pen on white paper they use comical images to express their perspectives on Malaysian politics. Cartoonist Zunar, or Zulkiflee Anwar Haque is one of the few who strives to produce works of art to mirror the plight of Malaysians who are forced to deal with the oppressive antics of the ruling regime. His loony depiction of the government, entertains just as it enlightens the viewer/reader on the lowly disingenuous nature of the all-powerful Barisan Nasional. The artist’s work relies heavily on the inherent comical nature of his characters, as he put it himself. While personalities such as Mahathir and Rosmah provides much inspiration for his political bashing, Badawi and Najib are deemed as “uncartoonable”, he says, blaming their unflattering non-prominent facial features as a major stumbling block for cartoonists to make a living. His journey as a cartoonist began at the young age of 12, when his first cartoon was published in the Bambino magazine. He went on to produce work for Mingguan Perdana, Kisah Cinta, Gila Gila, Berita Harian, and New Straits Times. In 2009, he launched a political comic magazine, called Gedung Kartun. In the same year, his Brickfields office was raided by officers from the Home Ministry who confiscated over 400 copies of his magazines and subsequently banned them under the “Printing and Presses Act”. What followed was a crackdown on all of the outlets that sold his books where they were threatened to stop selling his work. 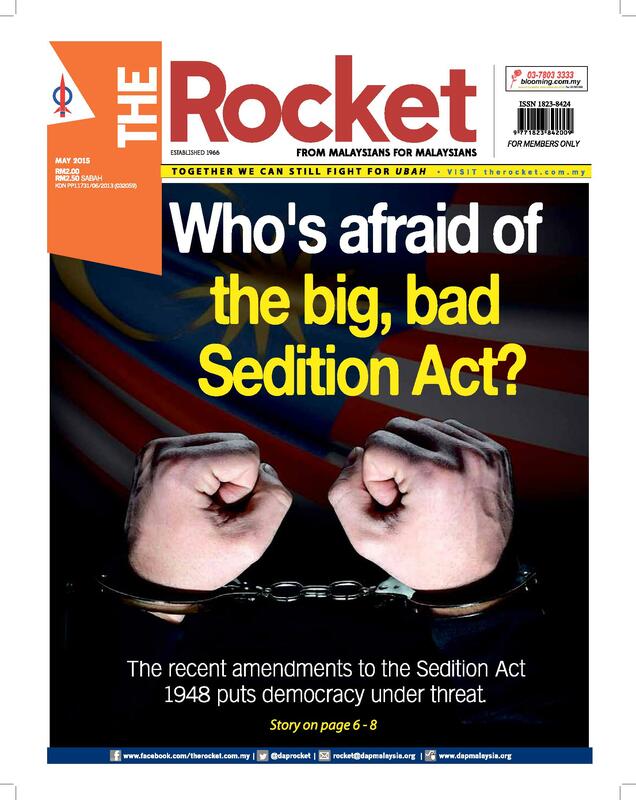 On June 2010, 6 of Zunar’s magazines were banned and deemed as “detrimental to public order”. Zunar’s attempt to sue the Malaysian Government for banning the books was to no avail. Reacting to the continuous oppression of the ruling regime, Zunar created “Cartoon-O-Phobia” which got him arrested under The Sedition Act. 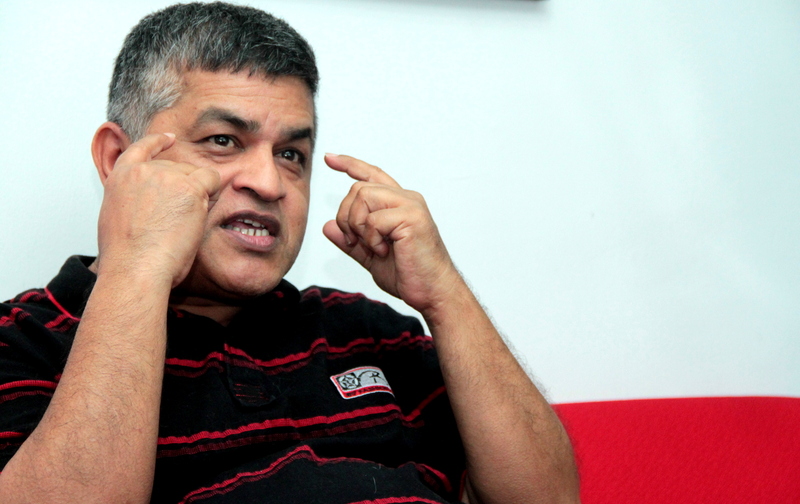 Zunar was detained at the KLIA police lock up after being dragged to 7 other police lock ups. After his release, his attempt to sue the police and the government for unlawful arrest and detention was in vain as the High Court has defended the acts of the police and government. However, he continues to fight on. None of the blows dealt to him by the government had given him a reason to stop using his art as a sharp criticism of the government. 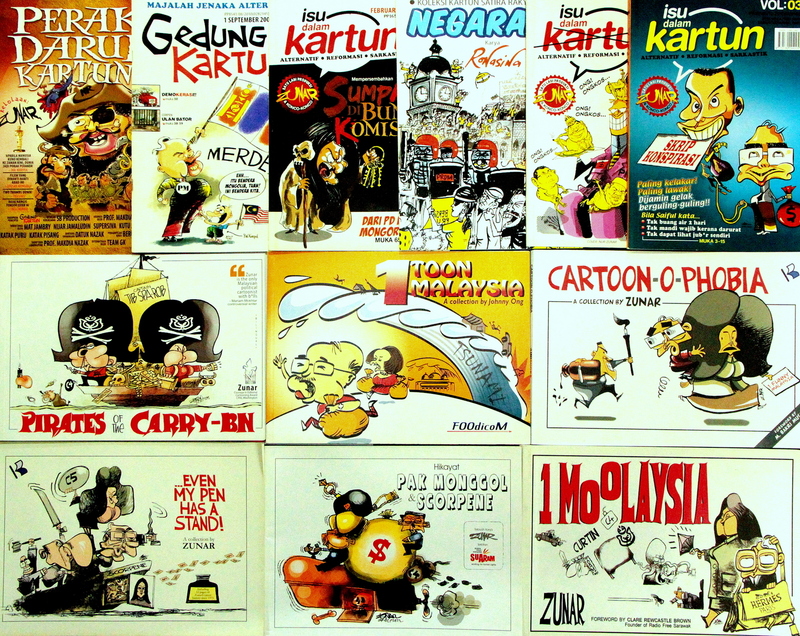 Through Kumpulan Kartunis Independen (KKI), where he helms a group of independent cartoonists and newsportals such as Malaysiakini, he showcases his work that takes a stand against government corruption and the antics of Barisan Nasional. The Rocket had the opportunity of interviewing Zunar at his office in KL. There, he walks us through his thoughts on post GE13 and the challenges facing cartoonists like himself; which he flavours with wit and humour. How would you asses the scenario after the ban on Gedung Kartun in 2009? It does seem like quite a challenge for cartoonists to return to work as usual after the disappearance of this platform. The Gedung Kartun was created to provide a space where independent cartoonists can express their views. But when Gedung Kartun was closed, the magazines couldn’t be sold, and I wasn’t able to pay my cartoonists. So they left. I wouldn’t say that they were fired, rather, we agreed to end their employment. Later I formed the KKI (Kumpulan Kartunis Independen), which is a “wadah tumpuan” (focal point) where cartoonists share their cartoons. As opposed to before, where I was the boss, this time it is a joint effort. So can I conclude that the government’s oppression on the cartoonists has seen some success on the formers part? They succeeded in one aspect; in terms of sales, as they blocked our sales following the ban. However, they weren’t able to prevent cartoonists from creating cartoons. I still do sell my work, but not at mainstream outlets. But there is a risk in doing that, right? Of course. Well, they did succeed in preventing our books from being sold. It seems like there is no way out from continually being forced to stop selling your work, would you say? The social media and the internet is where we showcase our work now, but this market isn’t as huge as a marketing network. But we persist. What do u see are the challenges faced by political cartoonists? Firstly, cartoonists need to free their mind to produce laudable work, and at the same time, read and understand the issues in the country.This is so that their output is high in quality and relevant. Other than that, a cartoonist must be able to stand the pressure exerted on them by the government. Are there cartoonists who have been “bought” or who have switched sides? Yes, this would reflect the hardiness of the artist, if they cant handle the pressure from the other side, then they just can’t. You see, the government would attempt to stop you via a few tactics, that includes threats, and “gifts”. There are some who can withstand the barrage of threats, but are softened when bribed. This is something I stress to the KKI members, that our mission is the most important thing. Our minds have to be focused on the final goal. How do you personally overcome these challenges? I am absolutely clear about my duty as a political cartoonist to criticize the government, just as those like me throughout the world. But the duty of a Malaysian political cartoonist is much harder; our duty here is to change the government. The situation here is different compared to what cartoonists abroad face. For instance, in other countries, when a corrupt president of a foreign nation is replaced, the country would do better under the new president. But to realize a better nation in our homeland, we have to change the entire government. That is our mission. We have a party that has ruled our country for over 60 years, which is something unheard of in other countries. I have had to sacrifice a lot because of this mission. Has it ever crossed your mind the chance to accept these “gifts” from the other side to alleviate your financial burdens? Money is not the ultimate goal. Money is the vehicle to attain your goals. Of course we do need money, but the ultimate goal is to push for reforms in the country. I would like to see a better Malaysia, and money is needed to achieve this goal. There are some who join politics for the money. To them, politics is the way to money. How far will you go, or how much more will you sacrifice to achieve this goal? There is no limit for the sacrifices that must be made. It is a duty for us human beings to sacrifice, if we do not, then we are not human beings. The value of ones life is measured by what we can give others. If we have 10 dollars with us, no value can be derived from that. But the amount we wish to give others from that 10 dollars is what defines us. The importance we place on people other than ourselves is the sacrifice which reflects our measure as a human beings. The Prophet Muhammad also sacrificed a whole lot and lived a simple life because of how much he was willing to sacrifice for others. Has this yearning to sacrifice ones self for the betterment of society perhaps been inspired by cartoonists from other countries? I have not seen this in other cartoonists. These traits are inspired from heroes such as Nelson Mandela and Mahatma Gandhi. As reflected in their lives, sacrifice gives meaning to life. Do you think you have succeeded in that respect? I wouldn’t say that I have succeeded, but I find what I do immensely fulfilling. I’ll give you an example, 2 nights ago, I had auctioned my work; which closed at RM1000, and I did not accept that money. And that gave me satisfaction. What changed that perception of fulfilment amongst common people? In Malaysia, the issue is with our system of values. What do we as Malaysian value? If people value money, then is a person who has a Mercedes Benz someone who is successful? When people are labeled as being successful based on their Mercedes Benzes and Bungalows then our system of values is broken. The majority of people have this view; that people who are in power will be respected. It doesn’t matter if the rich and powerful have committed any wrongs; they are nonetheless worshipped and respected here. We often hear jokes, though just a joke, it speaks volumes of our system of values. “I’d rather become a sweeper (tukang sapu),” they’d say. This means that being a sweeper is something frowned upon in society. Or even“your face is that of a nasi lemak seller”, though it is a harmless jokes, it means that a nasi lemak seller profession is one that is lowly. Couple that with the view that someone in power such as a minister or lawmaker is supposedly someone worth respecting, even if they are corrupt. That seems to be the state of things here. If we look at the 70’s , our values weren’t like this. People then valued other things. I remember that my Guru Besar was someone who practically lived in the school, it was his home. If students had no money he’d buy pencils for them. To him, no value was put on money, but rather the future of his school meant the world to him. Such was his dedication. This article was written by admin on Tuesday, July 22, 2014 at 1:02 pm. You can follow any responses to this entry through the RSS feed. You can leave a response, or trackback from your own site.